"How Green Can You BE ?" 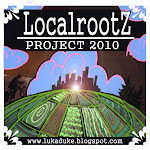 So in case you didn't know Luke aka Lukaduke is also a reggae deejay and part of Maine's original reggae soundsystem called Cognizant Sound. Cognizant Sound has been selecting tunes and chattin up the reggae scene since 2002. Representing Cognizant Sound is Geofferson, who is currently based out of Philadelphia and Lukaduke outta Portland, ME. Cognizant Sound has been supplying pure conscious vibes all along the East Coast. With a heavy emphasis on roots and culture, Cognizant Sound will take you on a musical ride through the classic riddims of yesterday all the way up to the current boom tunes running Jamaica and the rest of the world. Keep updated with all things cognizant at our blog. Keep it Cognizant ! Also please become a fan of facebook here ! Being part of a reggae soundsystem has really put me in touch with a lot of wonderfully talented people... and Fitzie is no different. Fitzroy Francis aka Fitzie Niceness was born and raised on the island of Jamaica, growing up Fitzie was inspired by such great reggae singers like alton ellis, gregory isaacs, beres hammond and dennis brown to name a few. After relocating to New York in the 80's he again found much inspiration from fellow reggae artist coming through NYC to perform , as well as various New York soundsystems like the infamous King Addies Sound with Danny Dread. It was here that Fitzie's vocal career started gaining momentum creating opportunities for Fitzie to perform alongside such great acts like Frankie Paul, Glen Washington, Screechie Dan and a whole heap of other big artists in the reggae business... slowly creeping his way north Fitzie then relocated to the city of Boston where his fame increased as he started his own record label by the name of F-Nice Productions... it was on this label that Fitzie recorded his first major hit entitled "Back to Jamaica"
It was at a dance held by Stout Style Sound in Boston that I first heard this track played... I was very impressed with the song writing as well as the sweet, soulful voice Fitzie possessed... however it wasn't until a few years later that I finally had the pleasure of meeting him in person, and to my pleasant surprise I found out he was now living in South Portland. From that day on we have shared our passion for good music and are always pushing each other towards bigger and better things...and it is not uncommon to see Fitzie grabbing the microphone whenever Cognizant Sound is holding it down! I will surely keep you posted about Fitzie Niceness and the Soul Union Band's upcoming appearances. In fact they will be performing at this year Sugarloaf Reggae Festival ! here is a clip from that Danny C's Caribbean Flava show!